As the IPCC report notes, the oceans absorb approximately 93 per cent of the warming of the global climate. When we account for all the data, including the heating of the oceans, air, land, and melting of ice, there has actually been more global warming over the past 15 years than during the previous 15 years, with the climate accumulating heat at a rate equivalent to four Hiroshima atomic bomb detonations per second during that time. 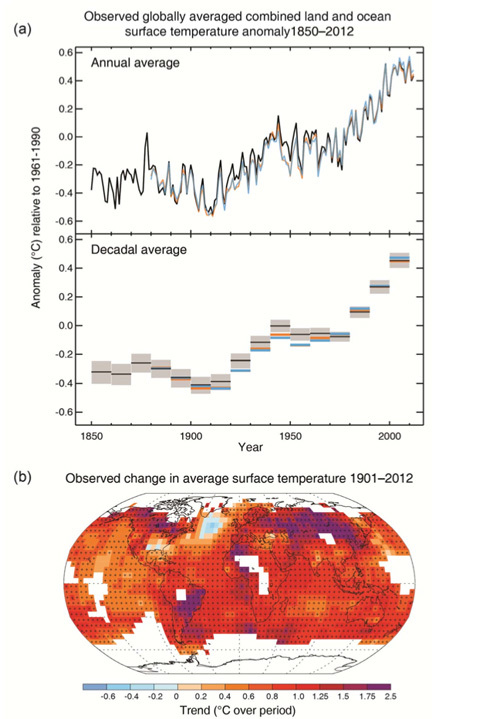 The IPCC also notes that the global surface warming speed bump is based on cherry picking. The surface warming trend from 1997 to 2012 is lower than the average projection made by climate models, but the surface warming trend from 1993 to 2007 was significantly higher than projections. That’s mainly because during the 1990s, ocean cycles acted to accelerate human-caused global warming, while in the 2000s, more heat has been transported to the deep ocean layers. These cycles average out over time, and the long-term human-caused global warming trend is crystal clear. ….many of the key quantifications of change have stubbornly remained within very similar uncertainty ranges over the set of five assessment reports since 1990. Sea level is now projected to rise by between 0.29 and 0.96 metres by the year 2100, compared to a range of about 0.32 to 1.08 metres in the 1990 report. And with a range of 1.5 to 4.5 °C, projections of the response of global mean temperatures to a doubling of atmospheric carbon dioxide concentrations have arrived back where they started in the first report, after some minor ups and downs on both boundaries over the course of the five reports. This is not to say that there has been no progress. Cloud feedbacks, an issue of long-standing debate over the years, are now assessed as likely to be positive overall. Patterns of projected precipitation change, another conundrum, are emerging with high confidence: more rain and snow is expected in high latitudes, whereas the more arid regions in mid-latitudes will probably dry out further. It is also important to keep in mind that the number ranges given in the first report were based on very patchy knowledge and could quite plausibly have been overturned by further work. The fact that they have stood the test of time may be testimony to the excellent intuition of the 1990 IPCC authors — or just pure luck. In any case, thanks to almost two and a half decades of intensive work, we now know that the climate is warming, and confidence that we understand the most important causes, feedbacks and impacts of this warming is immeasurably higher. 0.85 – the amount in degrees Celsius that the world’s land and oceans warmed between 1880 and 2012. 3.7 – the amount in Celsius of extra global surface warming we will likely get between 2081 and 2100 if greenhouse gas emissions stay roughly on their current path. 14 – the number of chapters in the full Climate Change 2013: The Physical Science Basis report. Australian scientists feature as authors in 11. 19 – the amount in centimetres the world’s oceans have risen between 1901 and 2010. 36 – the number of pages in the summary document. 39 – the number of countries represented in the list of authors and review editors for the full report. 40 – the percentage rise in the concentration of carbon dioxide in the atmosphere between the years 1750 and 2011. 55 – the number of countries represented in the list of expert reviewers. 63 – the amount in centimetres of extra sea level rise we will likely get between 2081 and 2100 if greenhouse gas emissions stay roughly on their current path. 90 – the percentage of the extra energy in the climate system between 1971 and 2010 that has been taken up by warming oceans. 209 – the number of lead authors who worked on the full report. 600+ – the number of contributing authors to the full report. 1089 – the number of self-appointed expert reviewers of the full report. 1250 – the number of figures (that’s charts, graphs and other eye candy) contained in the full report. 2000+ – the number of pages in the full draft of Climate Change 2013: The Physical Science Basis. 9,200 – the number of scientific publications cited in the full report. 54,677 – the number of comments made on the full report by the group of self-appointed expert reviewers. 1,400,000 – the number of words in the full report. 2,000,000+ – the amount in gigabytes of numerical data gathered from computers running models of the world’s climate systems. 30,000,000,000 – the tonnes of ice that “likely” melted from the Antarctic Ice Sheet on average each year from 1992 to 2001. 34,000,000,000 – the tonnes of ice that “very likely” melted each year on average from the Greenland Ice Sheet between 1992 and 2001. 147,000,000,000 – the tonnes of ice that “likely” melted from the Antarctic Ice Sheet on average each year from 2002 to 2011. 215,000,000,000 – the tonnes of ice that “very likely” melted on average each year from the Greenland Ice Sheet between 2002 and 2011. 275,000,000,000 – the amount of ice in tonnes per year which “very likely” melted from the world’s glaciers between 1993 and 2009. 1,339,000,000,000 – the tonnes of carbon dioxide added to the atmosphere from fossil fuel and cement production between 1750 and 2011. 2,000,000,000,000 – the tonnes of carbon dioxide added to the atmosphere from fossil fuel burning, cement production, deforestation and land clearing between 1750 and 2011. That’s 2 trillion tonnes folks. And finally finally, the report doesn’t consider the impact of all of these changes on human societies and the planet’s ecosystems – arguably the real issue. So one final number. Don’t worry. If you wear a hat no one will see it. I guess its because scientists don’t feel they have to repeat that CO2 is the basic cause for it now that they have concluded it with 95% certainty – and focus more on the effect the CO2 has on the feedbacks where all the “noise” is. Even though the signal is still very clear and is directly linked to how much CO2 is in the atmosphere as the main control knob. I guess what people need to realise is that what’s happened these past 100 years isn’t natural variability, but a clear sign of a major forcing from CO2 emissions. So being clear on where the natural variability is able to take climate is a good way for us to predict more what shape these will take on top of the warming signal. No. This time they talk of human forcings in the main text . Where the biggest human forcing is the lack of action because of the fossil fuel interests running anti-science campaigns and basically dictating politics through lobbyism. In other words, the Koch brothers and fossil fuel companies is probably one of the biggest forcings for climate change today. Right – so the FACT that Exxon-Mobil has been funding disinformation campaigns for years, and the FACT that the Koch brothers have been funding anti-environmental organizations like the Heartland Institute, etc add up to a conspiracy theory”, do they? You are a dishonest man, OL, a bald-faced liar. Go ahead – deny it. Very good summary of data on climate change. And it extremely likely that the Earth is round (although some still say it is flat) as far as I’m concerned Auntie Judith and her habitual trolls are truly busted and extremely boring. All they do is claim conspiracy and find fault, put down every fact and rarely propose a scientific counter argument. When I had cancer a few years ago an oncologist told me I had an 80% chance of beating it by taking certain chemotherapy drugs, I listened to him and I’m still here. Some non oncologists deny chemotherapy and if I’d listened to them and I would be dead. Talking about media the Daily Mail and the enlightened Murdoch’s empire reporting on the release is true to form, tucked well away from the headlines (which was a much more important item about a female model pushing/punching a protester on the catwalk. dont be so rough on them. most were home schooled. bible reading, bible memorization drills. lectures on the satanic federal government. and barely enough math to balance a checkbook..oh wait…jews… banks, what do they need with math? Bears likely defecate in wooded areas. .. Annnd the IPCC assessment is (quite probably) erring on the conservative side and very likely a massive underestimate of the amount of, er, defecation we’re in.